Bob Brewer, the former Anchor Brewing sales guy, is also in. Mark has known Bob for a long time, even before he worked at the brewery. Mark tells about how at Anchor, they were having trouble selling beer in New York. Fritz asked him and Bob to go to New York City and went from bar to bar making relationships. He says it is a huge accident that with a name like Brewer, he got into the beer business. Once when he worked for the Renaissance Faire, they asked him to put the beer concession booths together. He learned a lot about beer and met Fritz Maytag, who was personally delivering Anchor Steam beer. This was his transition into beer, when a beer distributor he had worked with offered him a job. Later, Mark offered Bob a job at Anchor. Bob was good at solving problems with the draft systems in bars, where they were serving Anchor beers. Mark thinks that the level of carbonation is lower now, which makes the beer easier to pour from the draft system. He also heard a brewer at the old Olympia brewery say that you could hide a lot of defects with extra carbonation. They are tasting some cans of Anchor Steam. The big cans are a new addition. They hold 19.2 fluid ounces. Mark says that the bars in New York at the time were stuck in their ways and they didn’t want to charge more for better beer, but Mark got them to do it. After the break, Steve introduces Steve Doty from Shady Oak Barrel House. He just opened his taproom on 420 First Street. Steve asks him how he came to be a beer guy. He was a lab tech in the wine business but he doesn’t drink wine. He found that craft beer was all about choices, which he says is ironic with the popularity of IPA. 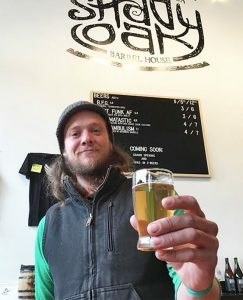 He makes sour beer, besides his IPA. All his beer is artisinal. He was named best new brewery in California in 2015 (or maybe 2016). Now his business is growing. They are tasting an IPA from Shady Oak Barrel House that Steve really likes. Steve asks why Anchor Steam beer is so popular. Bob says it’s because it’s so well made. He tells how Fritz Maytag introduced product consistency and hospital-level cleanliness, that make a unique high quality product. The term Steam for beer was a nickname given to the beer when early California brewers were making lager beer, but they didn’t have refrigeration. So it went to the bars highly carbonated and it produced a lot of foam. Someone noticed and compared the airy beer to tapping a tank of steam. As they pour some Apricot Sour, Steve Doty describes why it didn’t make sense for him to have an actual brew house. So he contracts with other brewers. He works a lot with Hen House. Mark explains that he buys the first stage of production from the brewer, they make it up to where he adds his flavors and blends. Most of his barrels are used French oak wine barrels. But he also has some gin barrels and port barrels. They all add their own flavors. Bob is a fan of sour beers, which used to be only produced in Belgium. They were hard to find until some locals started making them. Even if he likes sour beers, not all of them are good, some are not sour enough. The first domestically produced sour beer that he ever tasted was from Russian River Brewing Co. Many brewers are redefining the style, says Steve Doty. They taste an apricot-flavored sour beer that Herlinda Heras says tastes like a good Turkish dried apricot. Herlinda asks how they add fruit. For example, he gets grapes from Sonoma County and tries to use whole fruit. The beer has to be done and ready to go, but only then can have fruit added. He adds about 2 pounds of fruit for a gallon of beer. The fruit makes a new fermentation, and adds the flavor from the skins, pits, etc. Steve asks Bob to describe the Dickens Fair, which runs from Nov. 17 through Dec. 23 at the Cow Palace in San Francisco. It is produced by the same group that produced the Renaissance Faires. The Dickens Fair is a Victorian English-themed crafts faire. The son of the original Renaissance Faire, Kevin Patterson, is managing this Dickens Fair. It is a Charles Dickens Christmas Carol themed crafts and entertainment indoor festival. There are 7 theaters, sing-alongs, food, Christmas crafts and 19th-Century costuming.